Hello and welcome back! I hope you had a wonderful Thanksgiving. We had a great day at my parent's. Plus, pie for breakfast (Harper family tradition.) Loving it! These past few months I have been reading mostly nonfiction, with a break for light and fluffy (fantasy or Regency romance) every so often. It has been enjoyable, and I always like learning something from what I'm reading. My kids often get to hear me talk about the current book I'm reading as well, particularly the nonfiction. I enjoy discussing the various topics and viewpoints with them. 3 stars: Entertaining and informative. Interesting setup, with each chapter offering perspectives from Kidder and from his editor, Richard Todd, who has become a good friend over the years. I was particularly interested in how much the two have collaborated on many of the projects. I tend to think of writing as a solitary activity, which is then marked up in red pencil by an editor, then back to more solitary rewriting. Perhaps that is more in the world of fiction writing? On many of his books, Kidder and his editor worked together from the idea/outline stage all the way through to the end. It was a collaboration that worked. Kidder won a Pulitzer prize for his first novel, The Soul of a New Machine. They continue to work together, including on this book. They divided it up into 3 distinct types of nonfiction: narratives, memoirs, and essays. 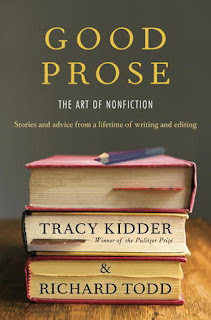 They also delve into some of the sticky situation the nonfiction writer runs up against: how to portray true events in a factual manner; which details to leave in or out; the ethics of writing from real life. They also have a section on style, including a handful of writing styles that they particularly take exception to. I liked it and appreciated the insights. However, 2 months later now, I don't remember many specifics. I guess it's a good thing I have the ebook copy! 3 stars: What would you do in her shoes? Abigail Thomas was enjoying her life and her marriage to Rich, when an accident changed it all. Rich was hit by a car (as a pedestrian) and suffered severe brain damage. After he healed from the immediate trauma, he could still function, but he was not the same man she married. Where some or perhaps even most would walk away at that point, Abigail was not going to do that. Somewhere in there was the kind, generous, fun-loving man she had married. It was for him that she continued to stick it out. She tried everything to help Rich. At one point, Abigail even brought her husband home to live. That attempt ended in disaster. He was too violent, too forgetful, too hard for one person to deal with on her own--even someone who loved him as much as she did. To some extent, she was able to let him go at that point. At least, let go of some of her ideas of what she should be doing for him, and some of the guilt for not being able to cope. He went back to live in a skilled nursing facility--permanently this time. This is a rather remarkable story of the way one woman coped with the unthinkable. She never divorced her husband Rich, despite his completely different personality and many medical needs. At the same time, she was able to finally move on with her life to some extent. She got a job she enjoyed, she sold her apartment in the city and bought a small home in the same town as her husband. She had her husband home for visits with her on a regular basis, but always took him back to the facility where he lived at the end of the night. She collected 3 dogs that helped fill the void of loneliness in her life, and she kept on. One day at a time. One of those books that made me really think about what I would do in her shoes. How would I handle this? I hope I could do it with the grace and acceptance that she has shown. Content: It seems like there was some language, but I honestly can't remember for sure. Mr. Mycoskie is the founder of TOMS shoes. He started his company based on a revolutionary concept: rather than run a nonprofit, he was going to use the profits made in a one-to-one correlation for making a difference in the world. So for every pair of shoes sold, his company gives away one pair of shoes to someone in need. His idea for this company started on a trip to Argentina, mingling with the poverty-stricken people in some of the towns and villages there. His idea, to create a company that would reward purchases with charitable giving, was a huge success. Less than 5 years later, his company had given away 1 million pairs of shoes, received all kinds of publicity, and generated all kinds of profit along the way. 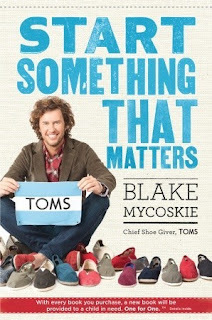 Each chapter had some advice, interlaced with anecdotes and lessons learned from the companies Mycoskie has been involved with. As I have thought about venturing into a business of my own, this book gave me valuable insight into how I could use what I'm passionate about to not only make money, but to make life better for other people at the same time. I think his biggest message is that giving doesn't have to be separate from business, and in fact, including a charitable component to your business can actually generate more profits, which you then use to do more good, and so on in an upward spiral of goodness. I'm sure I will go back and read it again as I go along. 3 stars: Much to think about here. 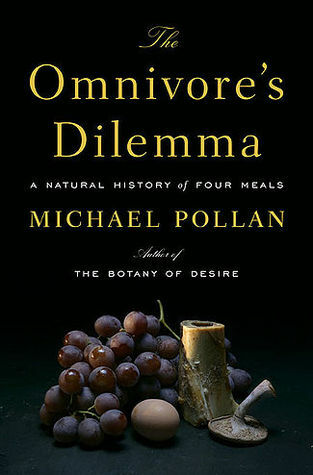 Pollan sets out to discover the provenance of each part of 3 very different meals: one made completely from processed foods, an all-organic meal, and an all hunted/foraged meal. I learned quite a bit along the way, including how much CORN we all eat. I shared with my family the way has corn has entered nearly every part of our diet and some of what I had learned about how it came to be that way. A few days later, my husband said, "I think we're eating more corn now that you read that book." Actually, I believe we're just noticing it more. In fact, I shared most parts of it with my family and it generated some good discussions. What does it mean when foods are labeled "organic"? I have always been a bit skeptical of that label, and this section showed me that was probably the correct reaction. Not that all organic food labels are misrepresenting reality, but many are. Should you have to kill an animal yourself in order to eat it? The farm run by Joel Salatin, with everything co-dependent on everything else sounded so ideal. We talked about that quite a bit, as well. Having the chickens follow the cows from pasture to pasture, etc. I also appreciated his discussion on the morality of killing animals for food. It helped me clear up my own viewpoint on that subject. This one was long! It took me about 3 weeks of regularly coming back to it to finish it. Even though it was published 11 years ago now, I was glad I read it. It made me that much more determined to a) grow what I can of my own produce and b) find local sustainable sources for meat and dairy products. I thought the information was presented in a fair and balanced way. 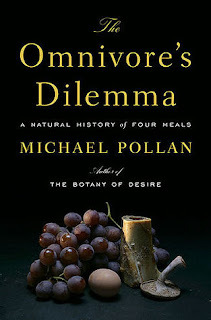 He admits that everyone growing their food is simply not feasible and not going to happen in this day and age. However, there is much room for change in how we handle our food--plants and animals alike. He makes a strong point that as consumers, if we insist on change, and use our dollars to show what's important to us, that change is possible. 3 stars: Hard to get through, but fascinating. Over time, he realized that she was suffering from Mutiple Personality Disorder. The first breakthrough came when one of the child personalities within Karen, a little girl named Clare, wrote a note to Dr. Baer asking him to help them. Through many years and significant changes in his own life (new jobs/divorce/etc. 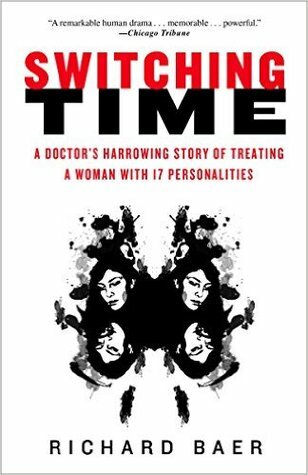 ), Dr. Baer treated Karen and all her personalities. Coming from a horrific past of abuse and torture at the hands of her father, grandfather, and other men, Karen finally was able to remember and process everything she had experienced, and eventually was able to become whole again. I had to start skipping the sections talking about her abuse. It was really bad. Even just reading about it was making me angry and sad and sick to my stomach. The way the adult women of the family just let it go on was infuriating too. It's hard to believe she even survived. It ended on a hopeful note, as Karen was making her way in the world as a whole person. I thought it was interesting that after she had integrated all the alters into herself, Karen had a hard time handling some of the everyday setbacks that came up, because she was used to one of her other personalities coming out to handle the hard stuff. Content: Vivid descriptions (often in first-person, as quoting Karen) of sexual and physical abuse. Not recommended for sensitive readers. For adults. What have you been reading lately? I'm all ears! 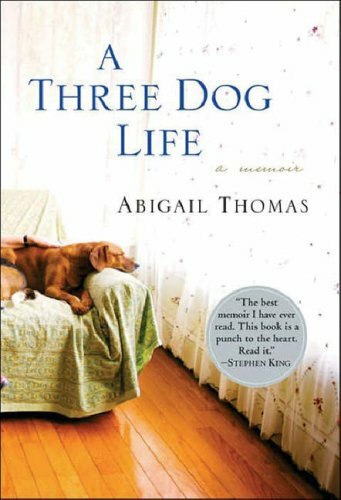 The Three Dog Life is an amazing book. And you know how to write well so I will suggest you to start doing www.essays.best/essay-service as it will help you with your expenses.